The end of the year is a good time to reflect: to look back, to assess, and to look forward. Looking Back: 2018 is coming to a close. Before assessing our current situation and looking toward the future, let me take a moment to offer my deep appreciation for Carlo Montemagno, our late great Chancellor. Carlo arrived on campus in August 2017, and departed suddenly on October 11th 2018. He was with us for just 14 months. But what a 14 months! I’d venture to say that SIU has rarely moved so far in such a short period of time! What a gift he was! Visionary, cheerful and courageous, Carlo Montemagno was a leader who boldly imagined what SIU could, and therefore should be. Not obsessed with short-term fixes and band aids, Carlo patiently set himself to build for the future. We are committed to that vision, that future. Thank you Carlo Montemagno. We have 3 signed contracts for new tenure track professors (Accounting, Finance and Marketing). These new professors have appropriate domain expertise, as well as fluency in the language of big data and Analytics. Our preparations to roll out the Analytics programs are close to completion. Other critical hires include: 1) a permanent Assistant Dean (Bridgette Sargent); 2) a Director of Online Programs (Michelle Johansen); 3) a new Business Manager (Kristine McCurdy); a new Online Recruiter (Antandra Campbell); 4) a new Development Officer (Stephanie Parton). The Pontikes Center of Analytics and Artificial Intelligence added three new members to its Board of Advisors: Gene Lee, Senior VP and Chief Analytics Officer from Caesars Entertainment: Helen Sun, Chief Technology Officer, STATS (world’s leading sports data and technology company); and Beth Mueller, Deloitte’s US Tax Analytics leader. Many of you have noted that things seem to move very slowly at SIU. That is indeed true, but it also tends to be true of all universities. Unlike the corporate world, our environment is not command-and-control (alas!). Nevertheless, to internal eyes, we have moved remarkably fast! For example, unlike other units which began new initiatives only upon Chancellor Montemagno’s arrival, we commenced a full year before he arrived. Also, we are the first college at SIU to actually land (contracts signed) new tenure track professors. We not only look to the future with hope, but we are chomping at the bit to get there! Thanks (again) our generous alumni are making it possible for us to commence planning for our third annual student career exploration trip--this year to Nashville. These trips give our students unique opportunities to experience (often for the first time) corporate environments; and to have their imaginations inspired by careers opportunities they may never have imagined before. The terms of the left hand side of the equation represent our inputs and processes. 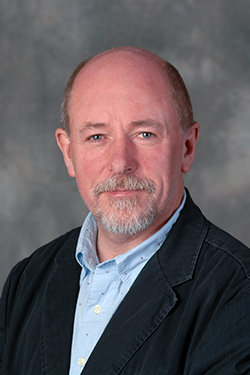 Our efforts to sharpen the education our students receive, will be enhanced by the new tenure track professor we have hired and by our pivot into Analytics. We have also gone to considerable lengths to expand our circle of corporate relations, to facilitate internships and job opportunities for our students. Our Student Services Office (under the capable hands of Assistant Dean Bridgette Sargent) is in the process of beefing up and expanding student services’ staff to enhance student preparation and corporate engagement. The terms on the right hand side of the equation reflect what SIU has historically been known for. Our job is to ensure we continue delivering exactly that type of student, as the world changes. Part of our students’ formation is to help them gain the polish needed to move confidently and smoothly in corporate and other professional settings. One piece of that formation is our Etiquette Dinner. Our 4th Etiquette Dinner will be held the evening of October 3rd 2019. We plan to bring in etiquette coach Melenie Broyles, to give the group a wonderfully instructive and fun introduction to the social niceties and professional behaviors surrounding work-related dining, etc. Also, our own Tom Boggs (CME Group Executive Director, Equity Products, SIUC ‘73), will give the group his seasoned and inspiring wisdom on starting and negotiating their careers. The New Year brings us the 150th anniversary of our university’s founding. We will celebrate this milestone in a number of ways. Our second annual Parrish Lecture Series and Award Ceremony. For this event, we bring in a keynote speaker, as well as honoring local businesses and leaders whose energy and passion have helped make Southern Illinois so special. With our Emerging Saluki Leader Award, we recognize recent graduates who have made an early impact in their professional fields and communities. In conversations with interested alumni, I am increasingly convinced how valuable a service-learning requirement would be for our students. An emerging trend among private, and some public universities and business schools, the “service-learning” requirement aims at creating collaborative partnerships between the College and its community (broadly understood), connecting traditional academic coursework to meaningful public and/or non-profit service experiences. The goal of service-learning courses is to help round-out our students into civic-minded citizens, with a broader appreciation of the world. I hope to gain traction on this project in 2019. I imagine some of you started reading this letter hung up on the notion of tree-climbing goats, and what they could possibly have to do with business schools. The very challenging semi-desert environment of the Sous valley in southwestern Morocco, is the only place on earth Argan trees grow. These strange trees grow to around 30 ft. in height and live for approximately 200 years. Their trunks are thorny and gnarled, and their crowns spread to a circumference of 230 ft. The fruit of the Argan tree is valued by local Berber tribes…and by goats. But how do the goats gain the treasured fruit? They have skills specifically tuned to the purpose! With little else to survive on, these goats have become adept at navigating these very difficult trees, to secure their delicious fruit. As you know, Illinois has been a very challenging environment for SIU and for your College in the past few years. In addition, the world of business schools is changing rapidly, with new forms of course delivery, new areas of interest, and new specializations. Among these changes, the plain-vanilla MBA is going away. What to do? 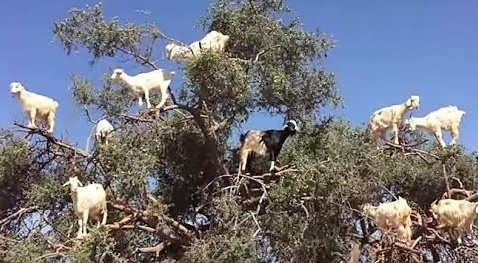 We could either die on the vine, or…we could learn from the tree-climbing goats! That is exactly what we have been doing, and what we will continue to do over the next few years: our online programs; our move into Analytics; our new certifications; aggressive Corporate relations efforts; new initiatives in student services, are all efforts to adapt ourselves to the challenges facing us. Thank you for the lesson tree-climbing goats!